It's just that kind of week. Again, due to pressing engagements during his brief stayover in San Francisco, Carlos Reygadas cancelled the interviews calendared by the Yerba Buena Center for the Arts. YBCA is screening Silent Light twice this week; this evening with Reygadas present to answer questions (tickets sold out a week ago) and Sunday, December 16, 7:30PM. Imagine my delight when Joel Shepard invited me to join him, Reygadas, in-house staff from the Community Engagement Department at YBCA, and critic Glen Hefland for lunch at Canton Dim Sum. Since most of the folks at the table had not seen Silent Light, it was not the place to ask questions about the film; but, the conversation was delicious nonetheless, as was the food. Reygadas was flattered that I will be seeing Silent Light for the third time this evening and agreed with me 100% that you don't do good films justice by seeing them once. It's like going to the circus once, he said. I often see films twice, I told him, and sometimes three or four times. Each time I enter from a different perspective. Sometimes I'm focusing on the actors' performances, another time on lighting and sound design, another time to gauge audience reception. There was some discussion of Reygadas's usage of non-actors and how he directs them. He never asks them to be anyone other than themselves. "Performance" would be the kiss of death for his intentions. Sometimes he feeds them a line and then films them saying the line. It's that simple. As for how he casts his non-actors, it's a process of living within a community and meeting a lot of people. It was hard to find the Plautdietsch-speaking Mennonites because they tend to be isolationist and distrustful. They don't congregate at a community center. Joël Barraquiel Tan, the Director of Community Engagement, encouraged Reygadas to share his techniques in how he solicits the participation of non-actors. He mentioned he was impressed by learning that Reygadas secured Magdalena Flores for Japón by requesting permission from her family. I brought up Gus Van Sant's recent comments that he partially casts for his films through MySpace and that he delights in working with young actors who don't even understand what acting is or what an actor should be aspiring towards. They're not on career track. They're not teen actors. They're just teenagers in a movie. Glenn Hefland wondered, however, if—by the nature of their creating a profile on MySpace—if they weren't already much more media-literate than the individuals Reygadas finds in Mexico? As successful as Silent Light has been on the festival circuit, sharing a jury prize with Persepolis at Cannes—coincidentally both films are in San Francisco—Reygadas complains about how the film has had difficulty being picked up in the United States, primarily because distributors just don't want to pay for it. They offered him $10,000 for the rights while other countries like Switzerland offered $40,000. Nearly every other country offered twice the amount the U.S. offered, which surprised him since the U.S. is the richest country in the world. Is it that the distributors assume only an elite few would appreciate the film? Finally, Tartan picked Silent Light up for an amount that made it worth his while. Joel qualified that said costs were just to secure rights and that distributors then had to strike their own prints and finance their own publicity. Whatever revenue is earned at the box office goes first to pay for the prints, then the publicity, and if anything is left over, then it's shared with the director. Reygadas confirmed that it rarely gets to that point. He gets his upfront money and that's about it. He likewise agrees with me that some films are not meant to be popular and successful during their first run, that it's their shelf life that eventually attracts an audience, and he figures that all his films will be bought up when he makes that one big film that will be a crossover success. If he can make that one big film, the public will become interested in all his other films. Until then, he's frugal in his productions. He knows just what kind of film he can make with the money he's got. It has surprised him that the movie has done so poorly in France. It probably won't do more than 10,000 "entries" and he doesn't know why for the life of him Silent Light has not done as well as either Japón or Battle In Heaven, particularly since Silent Light is his most accessible film to date. He wonders if it doesn't have something to do with his no longer being a new property that folks feel good about "discovering"? We joke that maybe if he could market some merchandise with his films, they might do better? I'd buy a Magdalena Flores action figure, I told him. I'd buy a Marcos Hernández action figure, Joël Barraquiel Tan added. Reygadas smiles. When I asked him who he might recommend among the new Mexican filmmakers, Reygadas admitted to not getting out to see others' films as often as he would like because he's all too often disappointed in them. Eschewing objectivity, he recommends Amat Escalante's Sangre, which he co-produced. Like myself, he also liked Cochochi. I look forward to his comments this evening. Did you guys get any chicken feet at the dim sum? :) So are you gonna see Silent Night again? Man, I knew about the screening he would introduce a long time ago but completely forgot about tickets so I'm going to the Sunday showing. For the most part, I'm not one for seeing directors talk. But Reygadas has only ever appeared intelligent and amiable and forthright so I was looking forward to sharing a space with him, to listening to him in person. AH, heck, what can you do? Chicken feet?!!! You geek! No, no, no, we had lots of other things--mainly shrimp cooked 101 different ways (my favorite was with the walnuts). Ryland, sorry not to see you there last night but glad you're getting to see the film on Sunday. You're absolutely right about Reygadas's intelligence, amiability and forthrightness. It's always an honor to learn from him. I hope Reygadas doesn't place too much importance on box office returns. I know, that's easy for those of us who don't have to pay the production bill to say, but there are so many factors rolled into that one number that it shouldn't be a measure of anything, in my opinion. I do get the feeling -- and have heard first-hand from a few critics -- that some of Reygadas's prior champions are disappointed with the "safeness" of this film. Danger = hip? 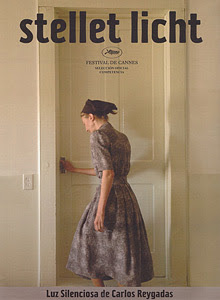 To me, this film shows a broadening palette, and I look forward to his next film as eagerly as I did Silent Light. "You certainly are having some interesting meals lately." Heh. Yeah, I felt like I was on a roll. I was hoping to do a whole series. Pizza with Apichatpong Weerasethakul. Japanese fusion with David Lynch. Epplers danishes with Martin Scorsese. Heh. Ah well, I can dream can't I? And never worry about plugging your work here at The Evening Class. I actually appreciate it since, as you know, I sample my blogroll in rotation and am sometimes not as timely as I should be about catching up with the good work of others.